The most imposing and best known in theater in Tombstone was Schieffelin Hall, inspired by the town founder. For two decades it was the largest theater between El Paso and San Francisco. Construction on the tallest adobe building in the United States began in early 1881 and was completed by May. It stood two-stories high, was 130 feet long with a 40-foot stage, could seat seven hundred patrons and presented legitimate theater. There were also a number of lesser-known theaters in town. On Allen Street was the Danner and & Owens Hall that had a large auditorium with chandeliers and theater boxes, curtains and foot lights. 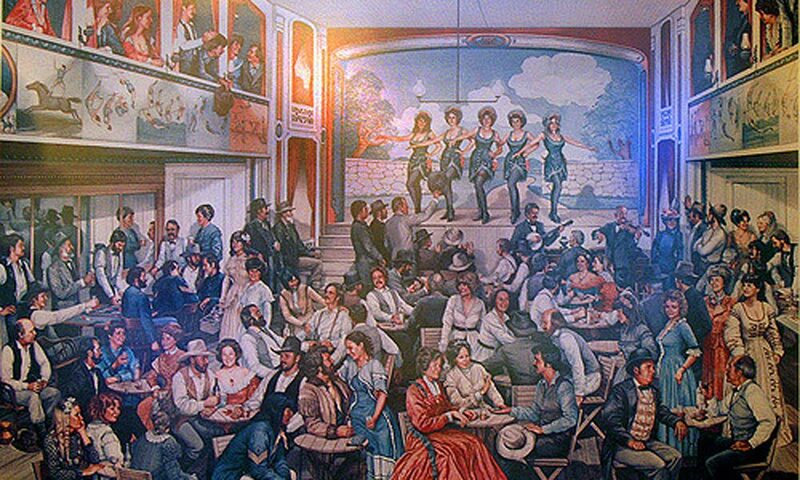 On Sixth Street was an Opera House that later became the Fontana Dance Hall. It was also called the Free and Easy. Dances and union meetings along with traveling theater troupes were held at Ritchies Hall on Fifth Street as did the Turn-Verein Hall on Fourth and Fremont streets. Down on Allen Street was the Bird Cage, a theater more for the working class. It opened on December 23rd, 1881. It was built for only $600 by a colorful character and former performer named Billy Hutchinson. The entertainment was low brow. The girls performed little singing and dancing skits for the audience made up of cowboys, cattle rustlers, smugglers and miners. They also worked the room as waitresses, hustling drinks and prostituting to supplement their income. A crowd favorite at the Bird Cage was Pearl Ardine, an Irish jig dancer whose specialty was picking up money thrown to her and jamming it into her stockings without missing a step. There was also Mrs. De Granville, who was billed as “the woman with the iron jaw.” She packed the room performing a strong-woman act. Nola Forrest a beautiful comedienne who won the heart of a bookkeeper who would be arrested for embezzling nearly a thousand dollars from his employer in order to buy her jewelry. The popular Uncle Tom’s Cabin played in June, 1882, Chaos occurred when little Eliza was being pursued by Simon Legree and his bloodhound while crossing the icy river. An inebriated cowboy, caught up in the drama pulled his pistol and plugged the dog. The audience was outraged and pounced on the clueless cowboy who was finally rescued by a peace officer and hauled off to jail. The next day the cowboy, now sober and repentant, offered his horse to the troupe as recompense for the dog. ​Owner Billy Hutchinson, once an entertainer always an entertainer. One night a drunken member of the audience boxes kept hurling catcalls and insults at the performers. Billy walked out on the stage and asked the man to silence himself. This only provoked more catcalls. Billy then sent two bouncers up to the box. There came the sound of a scuffle, shouting, arguing and then a gunshot. The horrified customers then witnessed a body fall from the box and on to the stage. The “body” turned out to be a straw dummy that resembled a scarecrow. Pat was having a little fun with his audience. Pat Holland, recently elected Tombstone’s coroner, was standing backstage at the Bird Cage one evening as a sharpshooter was preparing to shoot an apple off the head of a young lady. Annoyed the shooter was taking too long to line up his shot Pat grabbed an old stage prop shotgun backstage and thinking it was loaded with nothing but powder and wadding, fired off a live load of buckshot. Turns out one of the employees had taken it out rabbit hunting that afternoon and left it loaded. The shot not only blew the apple to pieces but took off a large chunk of the gal’s topknot and sent it smashing into the opposite wall of the theater. When Hutchinson sold the Bird Cage and the new owners were Joe Bignon and his lovely wife Minnie. Standing six feet tall and weighing 230 pounds she was better-known as Big Minnie. Joe was short, something that made Minnie look even taller. She cut quite a figure strolling around town in her pink tights. She had a good heart and a simple, childlike soul and was a favorite in Tombstone. She and Joe did stage shows and the crowds loved them. Minnie could also handle troublemakers. One night a drunk put a nickel on the bar and demanded a drink. When the bartender refused the rowdy pulled his pistol and threatened to shoot up the place. “I’ll handle this” Minnie said as she walked up to the rowdy, picked him up, carried him to the door and threw him half-way across Allen Street. Tombstone’s “working girls” included a colorful group that included Blonde Marie, Lizzette the Flying Nymph, Madame Mustache and Crazy Horse Lil. These charming specimens of Eve’s flesh were not only tolerated, they were welcomed in Tombstone where the fine art of minding ones business was highly-developed. These “hostesses” who worked in the bars were there to meet, entertain and satisfy the lusty needs of the customers. Mainly it was to get them to buy drinks for which the girl’s commission was normally 2½ cents per drink. Sometimes they received 20% of what a man spent on liquor. Most supplemented their income by prostitution. They resided in cheap shacks clustered behind the saloons where they also plied their trade. There was no medical inspection available and venereal disease on both male and female was rampart. Thanks to the cheap liquor they drank, drugs they consumed, disease, poor living conditions and the hard lives they lived, these unfortunate ladies died by the score. The lucky ones quit the trade before the drugs, disease and alcohol did them in. Some madams were honest and good businesswomen. Most notable was Cora Adams. She was about thirty-five, pretty, with good manners and bearing. What set her house apart was the strict rule on honesty when it came to money. When a gentleman became noticeably drunk his valuables were taken from him and two invoices were made, one for him and one for Ms. Adams. When he called it a night and got ready to leave his valuables were returned. Residents of Tombstone bragged with civic pride that their prostitutes were superior in charity, decorum, honesty and manners than those in towns like Bisbee, Charleston and Tucson. The high class frequented the house of a beautiful French madam, Blonde Marie. She had no bar in her establishment and drinks weren’t served so fights were rare and not tolerated. She did however provide a bottle for her trusted clients. Marie worked for a French-run syndicate operating out of San Francisco a French “count” visited periodically to check on things. She made frequent trips to Paris and always returned with what the locals referred to as “fresh meat,” meaning a new crop young French girls. Marie always arrived in town separately from her girls. Marie accumulated a fortune and in the mid-1890s she returned to Paris for good, presumably to reside in elegant splendor. Crazy Horse Lil was cut of a different cloth. She was mean and tough. She loved to fight and her brawling kept her in jail about a third of the time. Her boyfriend was an aptly-named Irishman named Con O’Shea. During a party one night with some of the high class citizens (without their wives) three men came in and robbed her place taking hundreds of dollars in cash from the partiers. Lil complained loudest of all, something that should have raised eyebrows and when the same thing happened two more times her clients began to suspect however, for obvious reasons they didn’t want to go public so nothing was reported to the police. Money was also extorted from some of the more vulnerable lest their names would be “leaked” to the press. One man wouldn’t be intimidated by the skunks. He was supposed to leave $100 at a predetermined spot but when the pickup man arrived a constable was there to meet him. The pickup man squealed and it turned out Con and Lil were getting 50% of the take. Before the authorities arrived the two pulled up stakes and moved to Bisbee where she opened up a bawdy house in nearby Lowell. Burt Alvord was a big strapping, swarthy-looking fellow with a bald pate and an IQ that was said to be considerably less than his age, which was slightly less than his waist size. He did have a few positive attributes. 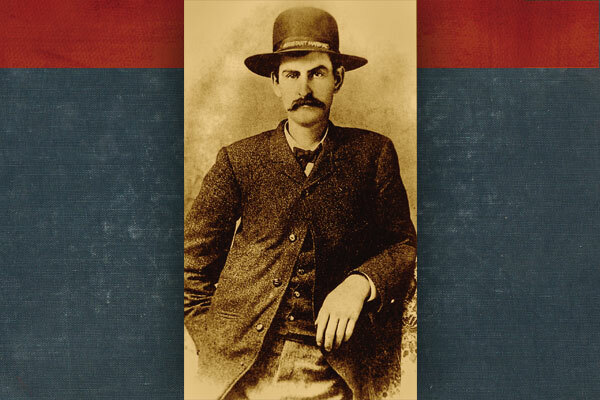 He was usually cheerful, had a sense of humor and was a popular guy around Cochise County during the 1890s. He worked for a time as a deputy for Cochise County Sheriff John Slaughter. Rumor has the sheriff said Burt didn’t know the meaning of the word fear. He went on to say he didn’t know the meaning of a lot of other words either. Burt’s major interests seems to have been beer, poker, horses, guns and practical jokes. Burt’s most notorious prank occurred when he and a little Irishman named Biddy Doyle, an ex-soldier, ex-boxer, ex-wrestler and practical joker extraordinary, schemed to relieve the good citizens of Bisbee of their hard-earned cash by staging a fixed wrestling match. Boxing and wrestling were the most popular sports in the mining camps and there was always a lot of money in the purse for the winner. Biddy went over to Bisbee and found a local sharpie to act as promoter. They needed an opponent so he found a muscular and not too bright Cornish miner who worked in the Copper Queen Mine. Before starting the betting he needed to find a suitable spot for the match. The only soft spot was the mule manure piled outside the mine in Tombstone Canyon. In physical appearance the little Irishman was no match for the big “Cousin Jack” but Biddy talked a good game and the crowd was betting heavily……that the cocky little Irishman would lose. The odds quickly rose to 20 to one against Biddy. A large crowd of sporting men from Tombstone showed up to place their bets. Burt and Biddy stood to make a small fortune if things went according to plan. Yep, they had a plan however, it might have gone smoother had they’d rehearsed a time or two so the fix wouldn’t have looked so obvious. Burt who acting as Biddy’s trainer bribed the Cousin Jack to lose the match then he bet all their cash on Biddy to win. The two wrestled briefly then Biddy got behind the miner and pushed his face down in the manure pile causing the big man to give up. While the spectators were momentarily stunned, the two boys from Tombstone grabbed the purse containing several hundred dollars, ran to their horses and rode out of town in a cloud of dust. Some of the citizens took umbrage at the two mischief-makers, suggesting their scandalous behavior had tarnished the town’s good reputation. Burt had an opportunity to make good in spite of himself when Sheriff John Slaughter hired him on as a deputy. From there he tamed the wild towns of Pearce and Willcox but Burt couldn’t walk the straight. While Burt was constable of Willcox he and some friends robbed the Southern Pacific west of town but that’s a story for another time. Tombstonians would long-remember the day a Gypsy strolled into to town leading a bear on a leash. For five dollars the miners could wrestle the bear. The bruin looked small but when he stood he was over six-feet tall. The boys all figured if one could lift one of his legs the bear could be dropped to the ground but none could manage that as the bear would wrap his front legs around the burly miners and gently lay them on the ground. Dozens of five dollars gold pieces were bestowed on the Gypsy that day. The rough and tumble miners begged him to return the next so they could have another tussle. But the next day the Gypsy and his bear were nowhere to be found. It was believed the saloonkeepers got together that night and paid him a handsome fee to leave town so the miners would return to their usual drinking habits. 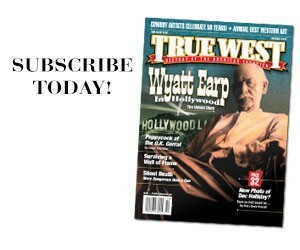 There was considerable rivalry between the copper mining town of Bisbee and Tombstone. Old timers liked to tell of the man from Bisbee who came to town leading a mountain lion on a leash. He walked into a saloon and everyone scattered out doors and windows. “I thought you Tombstonians were tough,” he bellowed. There was only one man left standing at the bar. He reached inside his shirt and pulled out a five-foot long rattlesnake and tossed in on the floor in front of the interloper. Both he and his mountain lion took off running and didn’t stop until they reached Bisbee. Mysterious Dave Did he break the law or serve it? Was there ever such a thing as a Buntline Special (12-inch barrel Colt)? If so, do any exist? In this country, they seem to exist only in men’s minds.